MANILA – The United Nationalist Alliance (UNA) today strongly criticized violations of the law and the abuse of power by the Liberal Party in Cebu, calling it proof that “Mar-tial Law” has been declared by the administration party in the vote-rich province whose top local officials are affiliated with UNA. UNA Secretary General Toby Tiangco said the LP has committed “glaring violations of the law and clear abuse of power” in attempting to enforce the suspension order on Governor Gwen Garcia and install the Vice Governor who is a member of the ruling party led by DILG Secretary Mar Roxas. “The LP-affiliated Vice Governor closed down two media outlets on flimsy grounds. The police erected barricades and deployed hundreds of armalite-wielding policemen to the capitol. Supporters of the Governor and even employees were prevented from entering the grounds. They were not even allowed to bring in food that they have prepared,” he said. “As Vice President Binay himself pointed out, there is no need to arm the policemen with armalite rifles since it was a peaceful assembly,” he said. UNA earlier said the LP had converted the provincial capitol into a garrison. Tiangco also dismissed statements made by the Liberal Party spokesman as recycled statements used by the latter to defend Gloria-Macapagal Arroyo. “Representative Evardone used to be one of Mrs. Arroyo's most loyal defenders and used to insist that Mrs. Arroyo was on the right side of the law each time her regime abused its power,” Tiangco said. “Like other Arroyo defenders who shifted loyalties en masse to the ruling party, the LP spokesman is recycling the same excuses meant to justify political harassment. Harassment is harassment. You cannot invoke “respect for the rule of law” and “daang matuwid” to justify a patently illegal act and the abuse of power. Those who are now invoking the rule of law and the righteous path should first examine their tainted political and moral backgrounds to avoid embarrassing themselves and their new masters,” he said. “Nothing can justify abuse of power, especially not the recycled statements from defenders of the discredited former regime. No matter what the LP and its apologists say, the people of Cebu know that Mar-tial law has been imposed in their province,” he added. The UNA official also took exception to claims made by the LP that party members have been treated in the same manner as Governor Garcia. He said in the case of Caloocan Mayor Recom Echeverri, an LP member, his suspension was not effectively served and his followers were allowed to camp out in front of City Hall with the least intervention from the police. “We did not hear the LP or the administration asking him to follow the suspension order while waiting for the Court of Appeals to decide,” he said. For UNA, Tiangco said respect for the rule of law also means extending courtesy to a co-equal branch of government. “Since a case has already been filed before the Court of Appeals, the administration party should allow the courts to decide,” he said. Tiangco added that Vice President Jejomar Binay, former President Joseph Estrada and Senate President Juan Ponce Enrile visited Garcia to show their support, and could hardly be compared to the time DILG Secretary Mar Roxas accompanied partymate Grace Padaca when she posted bail before the Sandiganbayan recently. “The leaders of UNA visited Governor Garcia to show their support for a beleaguered member and to make sure that the authorities respect the law. This is hardly a controversial move. It cannot be compared to DILG Secretary Mar Roxas attempting to influence the Sandiganbayan when he accompanied his party mate Grace Padaca when she posted bail for a graft case,” he said. Tiangco also commented on the statement made by the LP gubernatorial candidate for Cebu that the people will render the ultimate judgment in the 2013 elections. “This is precisely our point and this is what makes the suspension order nothing more than a power grab by the LP, a desperate and blatant attempt to overturn the decision of the people of Cebu in the 2010 elections,” he said. CAMP SEC. RUPERTO K. KANGLEON, Palo, Leyte – The Regional Special Operation Task Group (RSTOG) of the Police Regional Office 8 (PRO8) scored in its stepped-up campaign against Partisan Armed Groups (PAGs) with the neutralization of Samar’s most wanted criminal and PAG member in an encounter in a hinterland village in Gandara town early morning yesterday. “We aimed to dismantle these PAGs to ensure a peaceful elections next year as the RSOTG is directed to arrest all PAG members with existing warrants of arrest”, Police Regional Director Police Chief Superintendent Elmer Ragadio Soria said. Soria identified the slain PAG member as Julito Aragon y Cachero alias Nonoy, 30, single, a member of Moloboco PAG operating in the First District of Samar. Aragon is listed as the Number One Most Wanted Person in Samar province and wanted for two counts of murder. Reports reaching PRO8 from Police Senior Superintendent Edgardo Basbas, RSOTG Commander, disclosed that focused police operation conducted by joint elements of RSOTG Tracker Team 1, Second Company of Regional Public Safety Battalion and Gandara Police Station at around 4:30 in the early morning of December 23 in the hinterlands of Brgy. Peñaplata in Gandara, Samar led to the neutralization of the suspect. The team, led by Police Inspector Chamberline Ludevice, was armed with arrest warrants for two murder cases docketed under criminal case numbers 11-0514 and 5516 dated May 25, 2012 and August 31, 1999 issued by Regional Trial Court Branch 41 and 3rd Municipal Circuit Trial Court both of Gandara, Samar with no bail recommended, respectively. “Instead of surrendering peacefully, Aragon opted to shoot it out with our policemen, prompting the law enforcers to return fire,” Soria added. The suspect was hit on the different parts of his body causing his instantaneous death. Police recovered from the suspect one Colt MK IV .45 caliber pistol bearing serial number 655915 loaded with 6 live ammunitions. The incident scene was properly preserved and processed by the responding SOCO Team from Western Samar Provincial Crime Laboratory Office while cadaver of the slain suspect was brought to Gandara District Hospital for post mortem examinations. The Moloboco PAG, in which the suspect belongs, is one of the two remaining PAG aside from the Montealto group operating in Samar province that was named recently as one of the 15 “priority areas” by the Department of Interior and Local Government. “We activated the RSOTG purposely to dismantle these PAGs and to ensure a secured and fair midterm elections next year,” Soria ended. MANILA – Indian companies are keen on expanding operations in the Philippines and hire around 5,000 Filipinos in the information technology (IT) sector, Vice President Jejomar C. Binay today said. “Together with the Filipino businessmen, we met with several Indian technology companies that have expressed strong interest to expand their operations in the Philippines, including employment of an additional 5,000 full-time Filipino employees,” he said upon his arrival from India. Binay met with executives of ESSAR Group/AEGIS, HCL Technologies Ltd., Syntel Inc., Infosys BPO Ltd., Tata Consultancy Services, and Interglobe Technologies. The Vice President also mentioned that the government of India is willing to extend relief assistance to Filipino families affected by Typhoon Pablo. “The Indian ambassador to the Philippines manifested the Indian government’s commitment to assist the victims of Typhoon Pablo, and the Ministry of Foreign Affairs conveyed their desire to provide relief to those who suffered in the calamity,” he said. Meanwhile, Binay said that he talked with Myanmar President Thein Sein and the latter sought the assistance of the Philippines in agriculture development. “Our Philippine Chamber of Commerce and Industry (PCCI) met with the Union of Myanmar Federation of Chambers of Commerce and Industry (UMFCCI) on December 20 at the sidelines of the ASEAN-India Commemorative Summit,” Binay said. “The fruit of that meeting is the likelihood of revitalizing the Philippines-Myanmar business relations through the signing of a Memorandum of Agreement between the PCCI and UMFCCI in the area of agricultural development, particularly in rice technologies, bananas, and related areas,” he added. Binay represented President Benigno S. Aquino III to the ASEAN-India Commemorative Summit and the 2nd ASEAN-India Business Fair and Conclave in New Delhi. “Negotiations of the ASEAN-India Free Trade Agreement in services and investments were also concluded in New Delhi just in time for the commemorative summit,” the Vice President said. “The summit results in stronger ties between ASEAN and India in ensuring economic relations, freedom of maritime navigation, security of contiguous waters, and the fight against human trafficking, illegal drugs and terrorism, among other issues,” he added. PALOMPON, Leyte – A special enumeration and validation of poor households in three barangays of Palompon, Leyte was conducted from December 11 to 18, 2012 by the National Household Targeting System for Poverty Reduction team of the Department of Social Welfare and Development. DSWD Region 8 Director Leticia Diokno informed that Palompon Mayor Ramon Oñate proposed for the enumeration of the residents of Barangay Belen, Barangay Central III and the validation thru the on-demand-application (ODA) for Barangay Lomonon. Director Diokno explained that these barangays were not included in the 2009 enumeration which resulted to the exclusion of residents from social programs of the Department of Social Welfare and Development, particularly the Pantawid Pamilya. This prompted complaints from residents of these barangays. Knowing the “inclusive growth” that is the thrust of the Aquino Administration, Director Diokno promptly called for the conduct of a special enumeration and validation in said barangays. A total of 234 households were scheduled for special enumeration and revalidation, 145 for Barangay Central III, 81 for Barangay Belen and eight for Barangay Lomonon. As reported by Merla Lianza, municipal social worker, Barangay Belen is a far-flung mountainous area that is only accessible thru single motorbike or the locally called Habal-habal, making it very difficult for enumerators to reach the area. Moreover, fear-provoking hearsays about the area also prevented previous enumerators from conducting the survey. According to Rebecca Mendoza, a staff of the Municipality’s Social Welfare and Development Office, the area is known for witchcraft and other forms of supernatural practices. However, Mendoza was quick to add that there is nothing to be scared of as these stories were untrue. This time, the new enumerators were assured that such stories were unfounded. They were also provided assistance from the barangay chairman. Meanwhile, for Barangay Central III, failure of the previous enumeration was attributed to the lack of dedication from previous workers, Director Diokno said. MANILA – The United Nationalist Alliance (UNA) today said DILG Secretary Mar Roxas has mounted a "power grab" in Cebu with the suspension of Cebu Governor and UNA stalwart and congressional bet Gwen Garcia. UNA Secretary General Toby Tiangco said with Governor Garcia suspended, the Vice Governor, who is a member of the Liberal Party and the running mate of the LP gubernatorial bet, takes over, thus giving the administration party effective control over the province. "This is without a doubt a power grab by Roxas and the LP. This is a return to the discredited practice of the Arroyo regime where the people's will is subverted and government power is used to harass and persecute political opponents," he said. The suspension stemmed from an administrative complaint filed in 2010 by the former vice governor who has already died. "Apparently, Secretary Roxas is using the vast powers of his office to dig up old complaints against local officials and use these cases to harass and intimidate. This is not 'daang matuwid'. This is Gloria part 2," he said. Tiangco added that Roxas has "hijacked" the administration's reform agenda for selfish political ends. "It is becoming apparent that the noble goal of moral governance is being hijacked by the selfish political agenda of the administration party and Secretary Roxas," he added. The order suspending Garcia comes just a few days after Roxas, based on the statement of an admitted jueteng bagman, ordered a probe into the alleged involvement of Gov. Romeo Espino of the Nationalist People’s Coalition (NPC) in jueteng operations in his province of Pangasinan. Tiangco noted that both Cebu and Pangasinan are vote-rich provinces whose governors are not considered political allies by Secretary Roxas and LP. "Both of them are running against candidates fielded by the LP, whose political boss remains Secretary Roxas," he said. He also said UNA expects Roxas, in his defense, to once again claim that those questioning the order are contradicting the President's reform agenda. "Mr. Secretary, we do not question the President’s reform agenda. We embrace the campaign to reform government, and to make government officials more accountable to the people. However, accountability should be applied to all government officials regardless of political connections or affiliations. That, for us, is the essence of walking the righteous path," he said. "The issue is not reforms. The issue is the disturbing pattern of political persecution by Secretary Roxas of the LP's opponents in the 2013 elections," he added. PASAY CITY – Senator Chiz Escudero wants some P52 billion immediately mobilized to help the country’s coconut sector and its farmers. “I hope Malacanang can decide on how to mobilize these funds at the soonest possible time. Now would be a good time to pump-prime the coconut sector considering the rising demand for coconut in the international market,” Escudero said. The P52-billion fund comes from a 24-percent block of shares in San Miguel Corp. that was part of about 47 percent of shares sequestered by the government on suspicions that these were acquired using coco levy funds, a tax imposed on coconut farmers since 1973 by the late strongman Ferdinand Marcos. President Benigno Aquino III’s spokesperson, Undersecretary Abigail Valte, said a Presidential Task Force on the Coco Levy was still finalizing recommendations on the custody and utilization of the fund. “The funds are there. But the government has not yet determined how these will be spent and, more importantly, how these can benefit the country’s coconut farmers,” Escudero said. “I hope Malacanang decides on this issue very soon because we might hit the point where we won’t be able to take advantage of the growth and where this growth might not trickle down to the farmers,” the senator added. Coconut farmers have said they prefer to receive cash from the coco levy funds, something that Malacanang had said they should not expect. “There is high demand now for coco oil and coco water in the international market. The Philippines is in a very good position to be a major supplier. This will be good for our farmers, but we have to start now. And it all starts with a decision on how to use the funds,” Escudero explained. Of the country’s 12 million hectares of farmlands, about three million hectares are devoted to coconut. Sixty-eight out of 79 provinces in the Philippines are considered coconut areas. PCSupt. Elmer R Soria, PRO8 Regional Director (right) conferring with Bishop Isabelo C. Abarquez (center) during a visit last December 8 at the Bishop’s House in Calbayog City. Also present are officers of PRO8’s Regional Special Operations Task Group. CAMP RUPERTO K. KANGLEON, Palo, Leyte – The Police Regional Office 8 (PRO8) will be partnering with the Roman Catholic Church to help ensure the peaceful conduct of midterm elections next year, especially in the province of Samar. “The involvement of the religious community is necessary to thwart election-related incidents and political violence especially in ‘priority areas’,” Police Chief Superintendent Elmer Ragadio Soria, Eastern Visayas Regional Director said, adding that the support of the church's hierarchy is vital in ensuring a secured and fair elections. 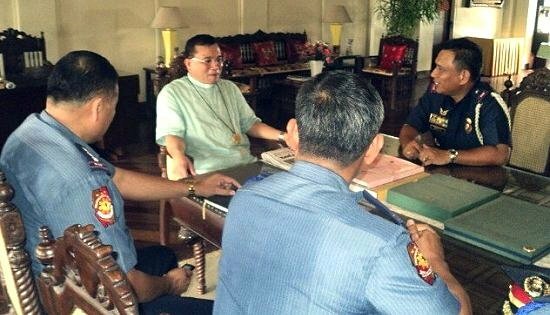 Soria met with Most Reverend Isabelo C. Abarquez of the Diocese of Calbayog last December 8, accompanied by Regional Special Operations Task Group (RSOTG) commander Police Senior Superintendent Edgardo O Basbas and Samar Provincial Director Police Senior Superintendent Eusebio A Mejos. Among the salient agenda during the meeting are the conduct of special mass and drafting of peace covenant among PRO8, Church leaders and local officials scheduled on January 13, 2013 to get a commitment from local candidates for peaceful and orderly elections next year. “This is intended to emphasize to the electorate that we are serious in making next year’s polls to be peaceful and the best way to encourage the support of candidates to commit themselves to support an orderly elections,” Soria added. Bishop Abarquez also assured that he will encouraged priests under his diocese and the church’s social arm in conducting fora and other means of voter’s education to educate the electorate on responsible voting. Soria added that PRO8 is also coordinating with other religious groups to help local law enforcement authorities in carrying out a violence-free electoral exercise. PRO8 recently activated the RSOTG to ensure a peaceful conduct of the May 2013 elections, especially in Samar province, which is included in the list of 15 “priority areas” for the May 2013 polls by the Department of Interior and Local Government. TACLOBAN CITY – The Department of Interior and Local Government reiterated its call for local government units to establish firecracker and pyrotechnic zones where people may light firecrackers and pyrotechnic devices in celebrating Christmas and the New Year. DILG Region 8 Director Pedro Noval Jr. informed this was contained in the memo circular dated December 6, 2012 signed by DILG Secretary Mar Roxas, in an effort to minimize casualties that come with the revelry this holiday season especially on New Year’s Day. The Provincial Governors, City and Municipal Mayors and Punong Barangays are also directed to designate an area where people may sell firecrackers and pyrotechnic devices. Moreover, in furtherance of public safety, public order and national security during the upcoming holiday season, enjoined local chief executives to regulate the sale, manufacture, distribution and use of firecrackers and other pyrotechnic devices in their respective localities as mandated by Republic Act 7183. The local authorities are called upon to see to it that only the following types of firecrackers are manufactured, sold, distributed or used namely, baby rocket, “bawang,” small triangulo, pulling of string, paper cups, el Diablo, Judah’s belt, sky rocket (kwitis) and other types equivalent in explosive content. All local officials are directed to take the lead in the conduct of an information campaign on the proper use of all kinds of firecrackers and pyrotechnic devices. They must warn people on the danger that polyvinyl pipes or boga may bring to users and others. Furthermore, local authorities are urged to be watchful of radical groups that may take advantage of the holiday season’s merriment for their lawless designs.